Tree removal in Morristown NJ can be a large undertaking. Our team of experienced professionals are here to help. Whether you’re looking to have your tree(s) removed for aesthetic or safety reasons, we’re ready to help. At Amazing Tree Services, our tree specialists complete tree removal with beautiful results. With many years of experience and our own trucks, equipment, and crane, we are sure to efficiently remove a hazardous tree from your property without delay. 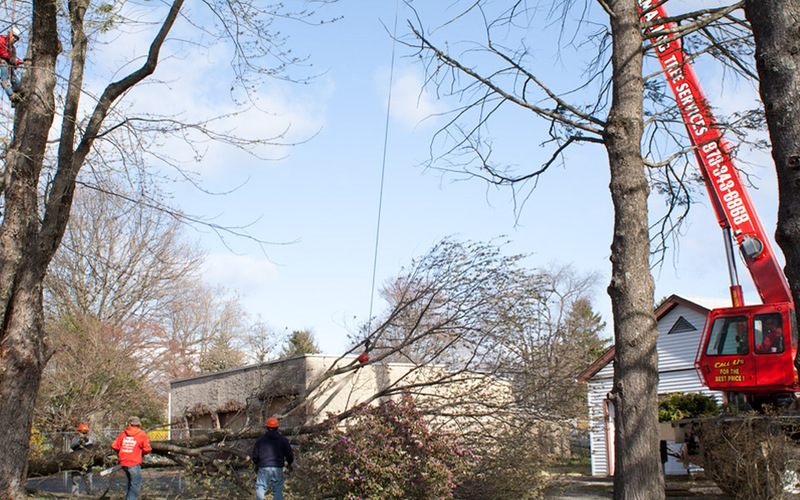 When you need expert tree removal in Morristown NJ, call us for professional and affordable service. Here we’re going to list a few reasons why it may be time to have trees removed from your property. Over time, trees can grow to be very unsightly. The roots might grow to large and far out that it’s causing damage to your property. To make sure these trees are unrooted and removed properly takes professionals with the right set of knowledge and tools. Keep these trees from growing out further and have them removed before they cause further damage. If you’re looking to change the overall appeal and aesthetic of your property tree removal is the way to go. Tree removal in Morristown NJ allows you to open up the space around your property that brings a much cleaner, more spacious feeling. It’s possible that creatures and harmful insects have taken up residence in these trees. To ensure the safety of those in the surrounding areas, you may need to have those trees removed from the property. If your property contains a dead tree it’s best to have us perform expert tree removal in Morristown NJ. We have plenty of experience removing these older, sensitive trees that can crack and crumble if not dealt with properly. 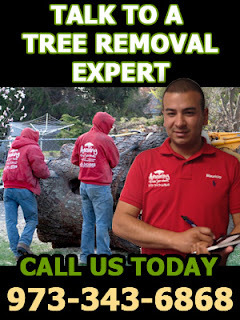 If you have any questions about our tree removal services please feel free to contact us. We’ll be happy to help with any concerns you may have. For more information about tree removal in Morristown NJ, call Amazing Tree Services at (973) 343-6868. Have the tree branches on your property grown out and/or become unsightly? Our team of professionals knows how to restore these trees to a pristine and beautiful state with expert tree trimming in NJ. Having tree branches spread too broadly can also be a hazard to those around it. Here are a few reasons why it might be time to have your tree(s) trimmed. Amazing Tree Services provides beautiful tree trimming to residents in New Jersey. We are a licensed, fully-insured, and affordable tree care company with years of experience working in branches and "the thick of it". When you call us for tree trimming in NJ, our friendly professionals will restore your tree's eye-catching appeal and give it a more healthy appearance. A well-maintained tree adds value and curb-appeal to your property, featuring energy-saving attributes and a natural quality to your home. You might have been witnessed to what happens when a tree’s branches begin to grow too far out. A storm could come through any day and seriously damage those branches causing them to splinter and fall. This could lead to all sorts of damages and further complications. Tree trimming in NJ can prevent this from occurring while also maintaining your tree’s health. Tree trimming is also a fantastic way to keep your trees looking aesthetically pleasing. Our tree trimmers can do it in a way that’ll improve the overall look of not only your trees, but also your property. As mentioned earlier, having your tree trimmed not only helps it to look great, but helps the overall air quality of its surroundings. Trimming creates better circulation through the tree which helps tree to grow strong and healthy. Trimming also deters from harmful creatures and insects from making the trees their home. Over-cluttered trees are prone to being the perfect breeding ground for all sorts of bacteria and troubling families of insects such as wasps and other potentially harmful creatures. If you have any questions about our tree trimming services please feel free to contact us. We’ll be happy to help with any concerns you may have. For more information about tree trimming in NJ, call Amazing Tree Services at (973) 343-6868. We are professional tree removal in Morris County NJ specialists that will help you with any tree-related concerns you might have. Trees can be an asset to any property, but over time some trees can die or become hazardous to your property - or neighboring structures. This is where we come in. We’ll remove these trees from your space so that you’re free to do what you wish with that area. If you’re considering having trees removed from you property here is a few reasons why you might want to. The crew at Amazing Tree Services are fully insured and experienced in prompt and expert tree removal in Morris County NJ. We achieve beautiful results through our commitment to your satisfaction and safety, utilizing our honed skills to develop and implement a strategy that removes a problem tree from your property without delay. With our own trucks, tools, and crane for special cases where dangerous trees are positioned close to buildings - we ensure that a tree is removed with ease. An old, dead tree can really be a detriment to your property. Not only that but it can be a danger to those nearby. Branches can crack and fall in the surrounding areas. It’s best to avoid this at all cost. These branches can fall on vehicles, pets, damage the property and even possibly land on someone. It’s a good idea to ensure this doesn’t happen and have us perform experienced tree removal in Morris County NJ. It’s possible you want to remove a tree(s) to deter wildlife from taking up residence in the area. All types of creatures and insects enjoy making their home in these trees - especially if they are dead. These creatures can be a danger to people and buildings around them. Not only that, but they might also be compelled to intrude into your home or building. Having this tree removed would deter and prevent this from happening. For more information about tree removal in Morris County NJ, call Amazing Tree Services at (973) 343-6868. At Amazing Tree Services, our tree experts are available for residential and commercial property owners alike. Our fully insured, professional commercial tree services in NJ ensure that foliage on your property retains its beauty without impacting your property’s aesthetic or safety. For years, our expert tree specialists have brought dedication and expert tree knowledge to each work-site, completing projects with beautiful results at prices to fit your budget. At Amazing Tree Services, our passion for tree care and services allows us to restore the appearance of overgrown or overbearing trees on your commercial property while promptly removing hazardous trees to restore safety to your office. Caring after trees on your property adds appeal to potential customers and clients. When visitors are greeted by well-maintained trees on your property, they are more inclined to visit your location. Commercial tree services in NJ ensure that your trees are shaped beautifully, free of broken or damaged branches, and carefully pruned in late winter to ensure proper regrowth in spring. With these commercial tree services, you will experience attractive trees on your property that welcome all who visit your office or work-space. We understand the importance of trees on commercial properties, and also consider their value to your office. Likewise, we understand that hazardous trees require prompt removal that doesn’t create a distraction throughout your office. When you choose Amazing Tree Services, we work without delay to remove dangerous trees from your property with efficiency and expertise so as not to create a distraction for your employees. We work with your interests in mind, our tree professionals using their valuable knowledge to deliver results to restore safety and peace-of-mind to your office. Our tree professionals are available for a multitude of services, and will promptly get to your office with 24/7 emergency commercial tree services in NJ. We are dedicated to making your office landscape a beautiful addition to your office – after all, it’s the first impression potential clients and customers see upon entering your property. For more information about our experienced commercial tree services inNJ, call Amazing Tree Services at (973) 272-6868.